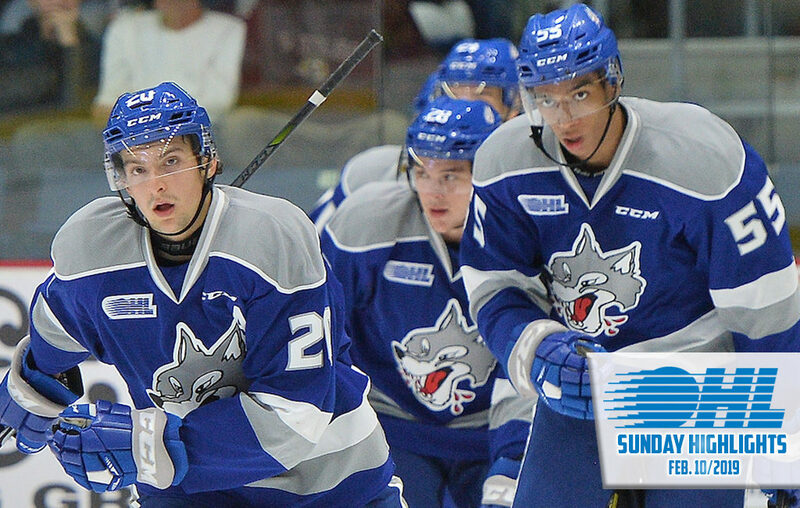 Shane Bulitka (15) scored the game winner midway through the third period as the Sudbury Wolves claimed a big win over the visiting Niagara IceDogs, pulling to within two points of first place in the Central Division. Buffalo Sabres prospect Ukko-Pekka Luukkonen made 32 saves while Blake Murray (26) and Jack Thompson (4) also scored as the Wolves outshot the IceDogs 44-34. Akil Thomas (27) and Ben Jones (32) responded with goals for Niagara while Jack Studnicka assisted on both. 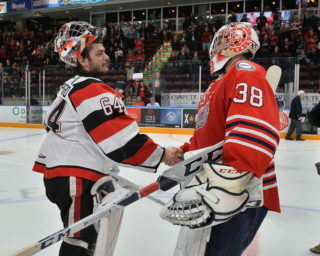 Stephen Dhillon turned aside 41 saves in the loss as the IceDogs lost their fourth straight game, falling to 32-14-7-0. Sudbury climbs to 33-16-2-1 after an eighth straight victory. The Wolves have won three of four against Niagara this season. The two teams will meet again next Sunday in Niagara. The Mississauga Steelheads wrapped up a 3-0 weekend as Cole Carter scored the shootout winner in a second straight game, leading his team past visiting Windsor 3-2. C.J. Clarke (8) and Nick McHugh (11) scored goals for Mississauga as they outshot Windsor to the tune of 53-29. Cole Purboo (24) tied the score at two with 2:25 left in the third period to force overtime and earn his team a point. Tyler Angle (16) also scored for the Spits while goaltender Colton Incze was outstanding, turning aside 51 shots. Los Angeles Kings prospect Jacob Ingham was impressive at the other end, making 27 saves while stopping all three Windsor shootout opponents he faced. The solid weekend gives the Steelheads a five-point cushion on fifth place in the Eastern Conference with a 26-21-5-1 record. Windsor drops a fifth straight decision, falling to 21-28-3-3 for eighth in the Western Conference. Three of Windsor’s last four losses have come in overtime or a shootout. What a difference 0.1 of a second makes. Greg Meireles (23) scored with a fraction of a second left in the second period and that was all the Kitchener Rangers needed on Sunday, blanking the Sarnia Sting 1-0 on the road. Luke Richardson stopped all 23 shots he faced for the shutout while Sarnia’s Ethan Langevin was also impressive, making 28 saves of his own. Sarnia outshot Kitchener 14-5 in the third period but couldn’t solve Richardson as the Rangers earned two big points to pull into a sixth place tie with Sarnia in the West Division. Kitchener owns a 25-24-3-0 record with three games in hand while Sarnia sits at 23-25-5-2. The Rangers have won three of four against Sarnia this season. Cole MacKay’s (20, 21, 22) first OHL hat-trick came in a second period span of 8:32 as the Sault Ste. Marie Greyhounds doubled-up visiting London 6-3. Jaromir Pytlik (3), Morgan Frost (34) and Barrett Hayton (21) added Greyhounds goals while goaltender Matthew Villalta made 28 saves. Frost and Hayton both finished with a goal and two assists, giving the former points in 13 of his last 14 games while the latter has multi-point outputs in four of five. Mac Hollowell and Tye Kartye both picked up a pair of helpers as the Hounds won despite being outshot 31-27. 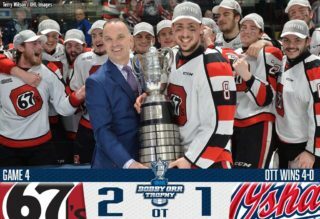 Adam Boqvist (14), Liam Foudy (30) and Kevin Hancock (41) all scored for London while captain Evan Bouchard had a pair of assists. The Greyhounds become the second Western Conference team to clinch a spot in the OHL Playoffs, improving to 35-12-5-1. London surrendered six goals in back-to-back losses in Saginaw and Sault Ste. Marie, falling to 37-9-5-1. Colorado Avalanche prospect Brandon Saigeon (34, 35) scored twice while Giovanni Vallati (10) and Kyle MacLean (15) each had a goal and an assist, powering the Oshawa Generals past visiting Barrie 4-1. Oshawa’s fifth win in the past six games saw the Generals outshoot the Colts 36-19 as Saigeon earned first star honours, winning 11 of his 17 faceoffs on the night while Allan McShane picked up an assist and won 12 of 15. Kyle Keyser made 18 saves, surrendering Barrie’s lone goal off the stick of captain Jason Willms (13) late in the second period. Kai Edmonds made 32 saves in the loss as Barrie dropped a third straight decision, falling seven points back of a playoff spot with a 21-28-2-1 record. Oshawa remains in a third place tie with Sudbury in the Eastern Conference holding a 33-18-3-0 record. 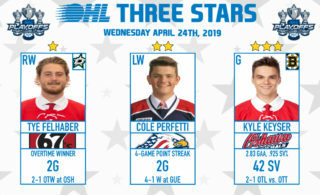 Dallas Stars prospect Liam Hawel (31) had a five point afternoon while Nico Daws stopped all 29 shots he faced for his first OHL shutout in a 9-0 Guelph Storm win over visiting Kingston. 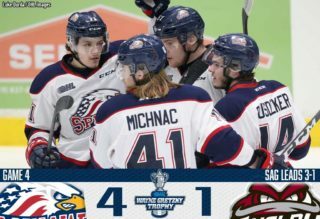 Rookie defenceman Daniil Chayka (4, 5) and captain Isaac Ratcliffe (35, 36) scored twice for Guelph while Alexey Toropchenko (15), Nate Schnarr (27), MacKenzie Entwistle (20) and Markus Phillips (4) added singles. Hawel finished with a goal and four assists while defenceman Owen Lalonde had four helpers. Guelph outshot Kingston 35-29 and went 3-for-4 on the power play while improving to 29-14-6-4 for fourth place in the Western Conference. Kingston drops an 11th straight game, falling to 12-40-1-1.